The St. John’s University men’s and women’s soccer team will be on the Big East Digital Network again this year. The women will be seen seven times during the regular season, while the men’s side will be featured six times. BEDN’s fall coverage kicks off on Sept. 16 with all 10 Big East men’s teams in action for their conference openers. The Red Storm will travel across the Hudson River that afternoon, taking on Seton Hall in South Orange, N.J. at 1 p.m.
One week later, the Red Storm’s conference home opener will also be covered by BEDN, as the Johnnies’ contest with Xavier will be carried live on FOXSportsGO.com and the FOX Sports GO app. Later on in the season, the Red Storm will close out the regular season with four-consecutive games on BEDN, beginning with a 2 p.m. matchup at DePaul on Saturday, Oct. 21. Following their contest with the Blue Demons, the Johnnies will see their final two home matches against Villanova (Oct. 25) and Georgetown (Oct. 28) carried live on the platform before wrapping up the contest at 2016 national quarterfinalist Providence (Nov. 1). Storm fans will get their first chance to catch the Red Storm on Sunday, Sept. 24 when the squad opens Big E1st play in Washington, D.C. at Georgetown. Last season, the Red Storm earned the program’s best result against a top-10 team when it played the then-No. 6 Hoyas to a scoreless draw in extratime. Georgetown went on to win the 2016 BIG EAST Women’s Soccer Championship and advanced to the semifinals of the College Cup before falling to the eventual national champion, Southern California. St. John’s returns home the following Thursday for its first Big East game at Belson Stadium. The Johnnies will play host to Creighton on Sept. 28 at 7 p.m. live on FoxSportsGO.com and the Fox Sports GO app. 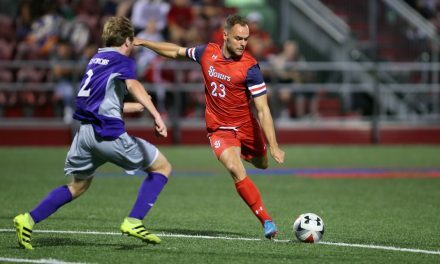 St. John’s will look to avenge a 2-0 loss to the Bluejays from a year ago, despite the Red Storm dominating nearly every aspect of the match last season. Three days later, the Red Storm will host Marquette at Belson Stadium on BEDN on Oct. 1 at 1 p.m. The contest will be a rematch of last year’s BIG EAST Women’s Soccer Championship semifinal that saw the Golden Eagles stun the Red Storm, 2-1 in overtime, on a bicycle kick in the 96th minute. Almost two weeks later, the Red Storm hosts Seton Hall on Oct. 14, beginning a stretch of four-straight games carried on BEDN to close out the regular season. St. John’s will also square off against Villanova (Oct. 19), Xavier (Oct. 22) and DePaul (Oct. 26) before the Big East women’s soccer championship opens Oct. 29.